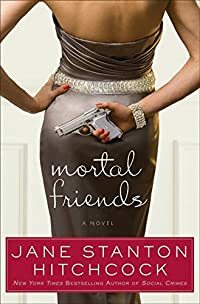 Mortal Friends by Jane Stanton Hitchcock, a Mysterious Review. Review: Jane Stanton Hitchcock crafts a tale of high society and murder in the stand-alone thriller Mortal Friends. The story is told from the perspective of Reven Lynch, an antiques dealer in Washington DC and best friends with Violet Bolten, who, with her husband Grant, is one of the city's most connected power couples. Reven and Violet are jogging when the latest victim of the Beltway Basher is found. The serial killings have the police stumped as there is little to connect the women other than they had all attended a society function at one point or another. But in a city where these events take place frequently, that's hardly a solid lead. Still, DC Detective Gunner asks Reven to be his eyes and ears at the dinners and gala events she attends. While there is a murder, a suspect or two, a detective, and an amateur sleuth, there's no sense of urgency in dealing with the crime and the resolution, when it occurs, almost seems like an afterthought. Mortal Friends proceeds along at what can best be called a leisurely pace. Written almost in the style of a personal diary, Reven notes what functions she's attending and with whom, what happens before, during, and afterwards, and the secrets and lies that unfold as a consequence. Presumably the reader takes on the role of Detective Gunner here, sifting through all the information to extract the one or two details that will lead to the identity of the killer. But Reven's narrative is almost clinical in its approach, with little emotion ever shown, and no suspense is ever generated. In the end, the cover is the most intriguing part of the book with Mortal Friends being more an insider's guide to Washington DC society than a mystery. And that's something of a disappointment, especially given the rich material the author had to work with. Acknowledgment: HarperCollins provided an ARC of Mortal Friends for this review.